Like the Grand Canyon in Arizona — which boasts spectacular yet unique views from either the North Rim or the South Rim — Niagara Falls is a vast natural wonder that comes with two distinct perspectives: the American Falls and the Canadian Falls. Often, this comes as a surprise to travelers, who visit without realizing the national divide and are forced to select one side or the other. Fortunately, we can present a guide to both sides of Niagara Falls, so travelers can make an educated decision for their Niagara vacations. What’s on the Canadian Side? When most people imagine Niagara Falls, they picture Horseshoe Falls on the Canadian side, and it’s no surprise why. Horseshoe Falls is the largest and most stunning of waterfalls the world over: Though only 170 feet tall, the Falls pull 750,000 gallons of water over the edge every second. The sound of the water, the feel of the mist, and the sight of complete landscape around Horseshoe Falls makes it a top world destination. 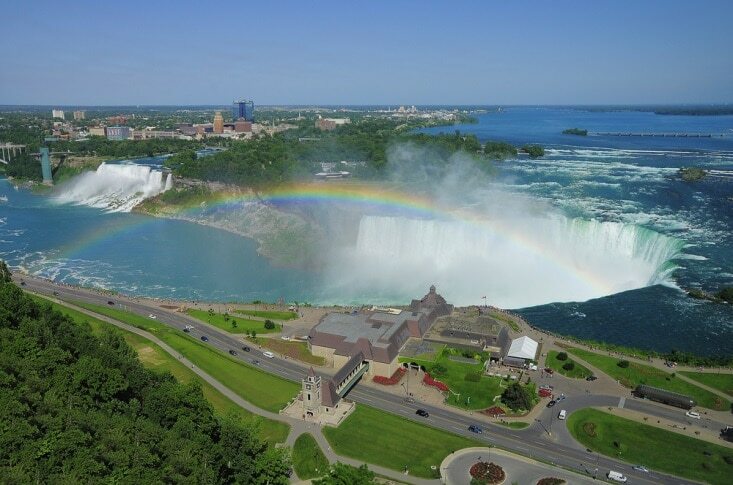 Because millions of world travelers journey to Niagara Falls each year, the Canadian side has hasted to cater to their needs with abundant amenities, like luxurious resorts, thrilling attractions, and a bevy of tours. The most popular trails are paved and replete with water fountains and lookout stops for easy, excellent viewing. The Canadian side certainly offers a classy experience of this natural wonder. What’s on the American Side? Though the Canadian side boasts the biggest waterfall, America claims two separate falls: American Falls and Bridal Veil Falls. Plus, from the American side, visitors can see a panorama of all three waterfalls connected by the Niagara River. The series is magnificent to behold, as millions of tons of water rush down and down. Niagara Falls and the surrounding region are protected areas under the New York State Park system, which means it offers fewer attractions for visitors to experience. In general, much more of the natural landscape has been preserved, which means the roads and pathways aren’t fully paved, and the forest is much taller and thicker than on the Canadian side. There are a handful of attractions similar to those seen on the Canadian side, including the Maid of the Mist and a small historical museum, but the most common activity for the American side is walking. Hiking trails and walking paths take visitors both above and below the Falls — where they are sure to get damp from the misty spray. As a rule, those who seek vacations in the thickest of outdoor settings will likely fall head over heels for the American Falls. However, unlike the Grand Canyon, which could take travelers hours upon hours to reach the other side, Niagara Falls can easily be viewed from all perspectives with a quick hop across the border. So, while most travelers will prefer to lodge on the Canadian side with all the bells and whistles of a luxury vacation destination, we heartily encourage travelers explore the American side, as well.